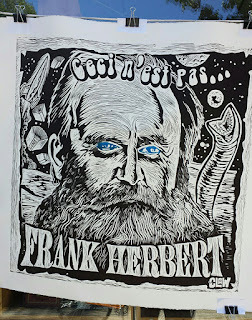 THE BRILLUSTRATOR: The CLAW and The Father of DUNE! 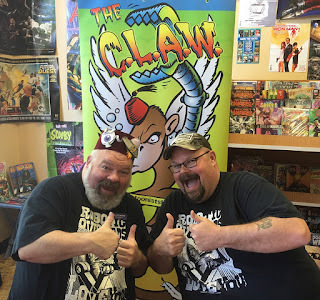 The CLAW and The Father of DUNE! Every year for the past several, my cartoonist group, C.L.A.W. has participated in Wayzgoose, which is a local hand-press and bookmaking festival celebrated at King's Books in Tacoma. 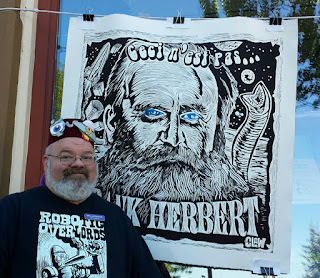 There are local printing and hand-press artists and enthusiasts, showing and selling their work, letting people run tabletop presses and there's even a t-shirt print shop that has a silkscreen press set up that prints t-shirts right on the spot! 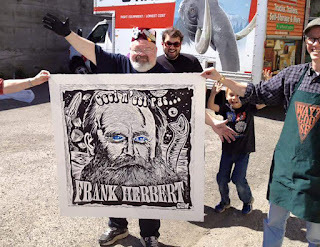 But the undeniable glory of the whole event are the groups that get to produce the giant 4'x 4' steamroller prints and the CLAW has always been one of the teams allowed to work with this medium! 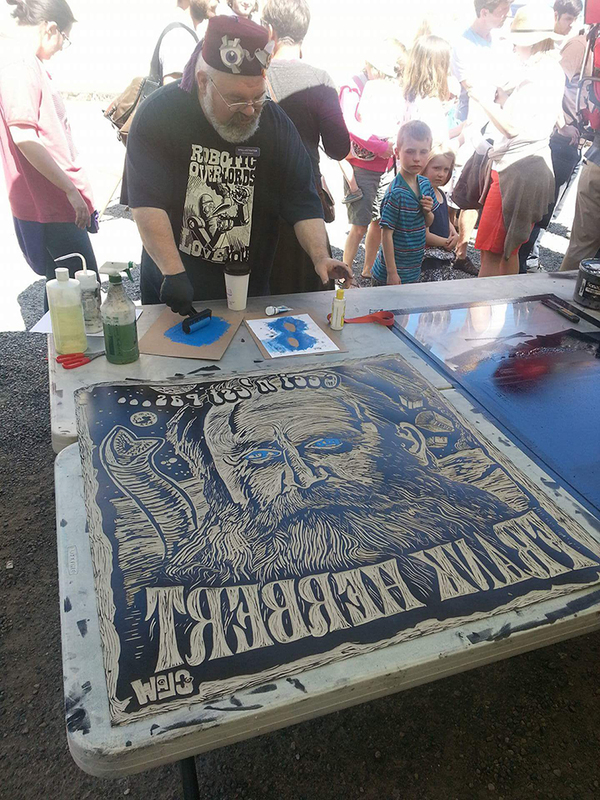 We create a design, carve it out in a large block of linoleum, and in the parking lot next to the King's Books building a steamroller waits to drive over the inked panel and large sheet of dampened paper (pressed between a sheet of plywood and padded mats, of course) and impress as well as emboss the image into the paper! The final printed pieces are beautiful things! This year, however was particularly exciting for me because I finally had a design chosen to be our print for 2016! And what's more--our theme for the design was Tacoma-born, science fiction master, author Frank Herbert, the creator of the "DUNE" saga! Now, I didn't carve the block by myself--several members of CLAW, including me< worked on it in the week prior to the event. I fretted and worried about it though! I didn't want mine to be the first CLAW print that didn't come off right!! 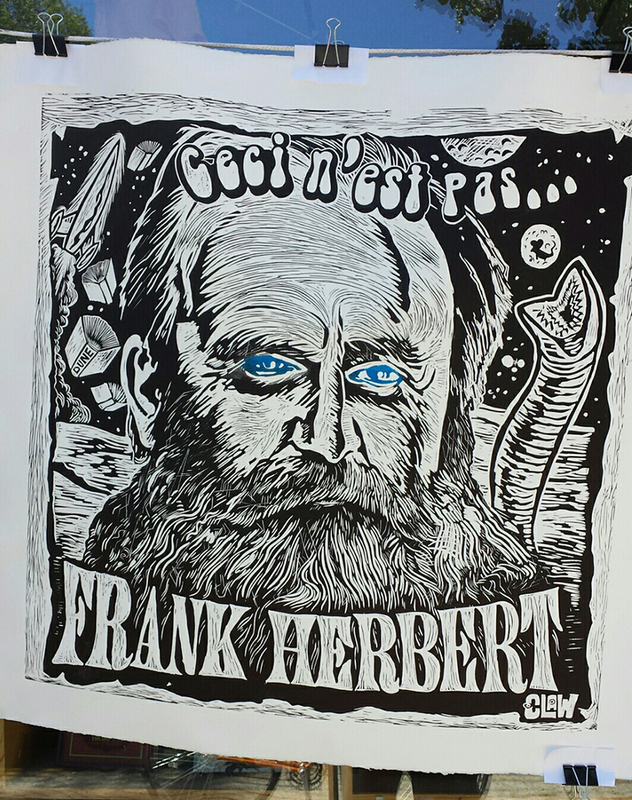 I had also had this stupid idea to use a second ink color to make the eyes blue, in honor of the "blue-within-blue eyes" of the Spice addicted Dune characters! And I had no idea if that was going to work either! So I worried! But everything went wonderfully smoothly! We cranked out our allotted 5 prints in record time and the admittedly crude method I chose to do the blue eyes special effect worked perfectly well! 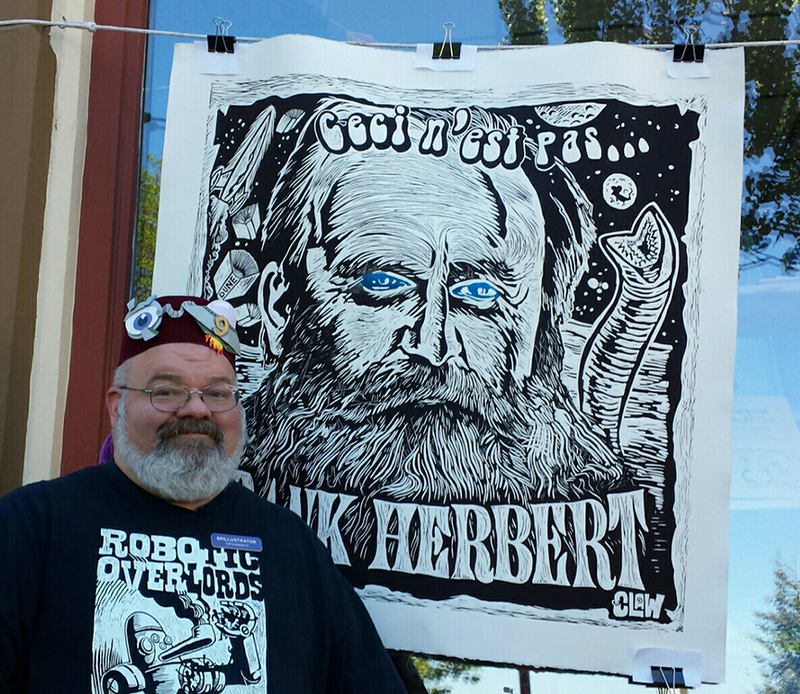 I turned out to be a fantastic looking print and the splash of color really made it pop! 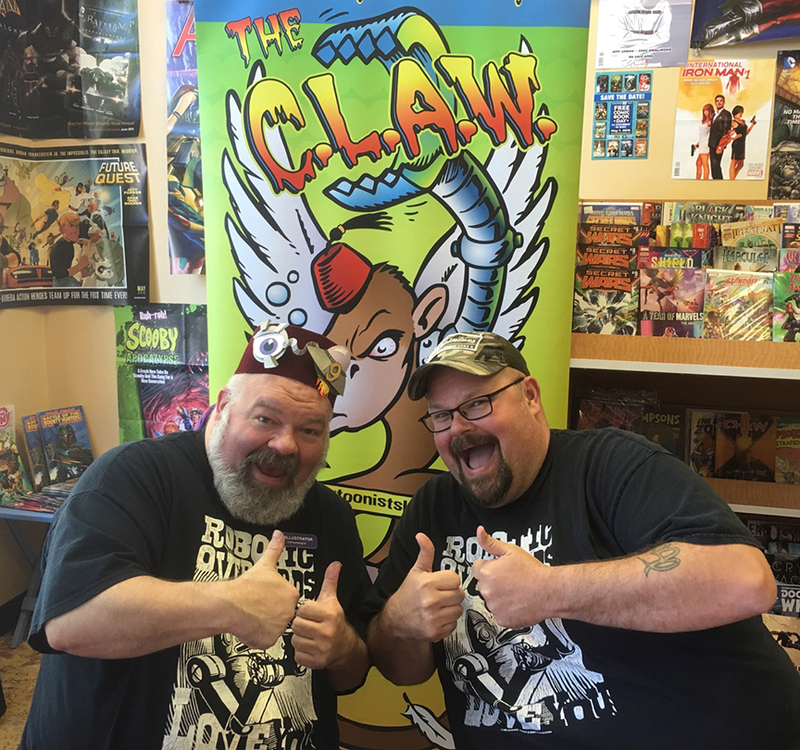 Anyway, here are a few photos from the event, including one of fellow CLAW member James Stowe and I manning the CLAW table inside Destiny City Comics (right next door to King's Books). If we look like we're having fun--that's because we are!